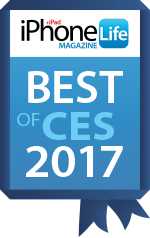 OtterBox uniVERSE Case for iPad Pro 9.7-inch and iPad Air 2 was named Best of CES by iPhone Life for 2017. The uniVERSE Case System combines trusted OtterBox protection with a modular platform to expand iPhone and iPad features. On iPad, the uniVERSE case boasts even more connection points, including two slotted rails that connect to a variety of modules, a new center connection point for mounting accessories and a removable spine where keyboards can be easily attached.